Year six of our annual gaming celebration on this blog. At the end of last year I wanted to find time for a few games and The Witness certainly gave me two days of intense puzzle solving early in 2017. It seemed almost tailored to me (as if the black box in my head was used to decide the training set used to introduce the puzzles) with the only exception being the few puzzles that involved audio cues. Unfortunately I also think that's a major weakness as anyone who doesn't learn like me should not be surprised to feel completely alienated by that learning path (also there's not much deeper than the visuals and a few twists to enjoy beyond the puzzles). A lot of the rest of my missed games were enjoyable but I'm reasonably happy with my list from last year despite a few things slipping through the cracks. But it's 2017 and I already noted that this year has been incredible (something about years ending in seven and video games) so let's check out the few highlights I thought we had to talk about. As one of the few people with a copy of the original NieR on my shelf, this was always going to be the sort of game story I'm attracted to. But it's also found a far wider audience thanks to a reasonable budget, some polished combat mechanics, and word of mouth as everyone attempted to avoid spoiling the glimpse they got of a world seen through this prism of a story. Games have (often through the focal point of various mechanics originated in RPGs) come to merge genres and offer experiences that are many things. Every open world game on this list does this to some extent. Stealth games now offer deep combat alternatives to restarting after being caught; immersive sims build around several ways of progressing. We are used to bending genre conventions and being offered several ways of playing games but rarely is it done like this - taking different styles of action (shooter) and moving the camera between them while retaining the same mechanics/rules. This is one of those games that is both long and also much of the emotional payload is built around various reveals that are best not spoiled (unless you've played the last game, in which case you know some themes that are about to be revealed). Even all of the side stuff that's mainly adding texture to the world is best stumbled upon rather than knowing what's coming so anecdotes aren't really suitable. Suffice to say it's a story about sapient/sentient androids dealing with the deafening echoes of humanity and it's all scored with a great soundtrack to bring up the emotional tones. The visuals are inconsistent, with some great particle effects and certain style/scale stuff mixed in with other rather uninspiring areas and dated/sparse assets. That's not helped by a PC port that didn't seem to optimise for all system configurations or offer meaningful options for lowering the impact of the most demanding settings. There are visuals to like here (while targeting 60fps on all platforms) but it's not something to play for the eye candy. The hype for this game points in the right direction: there's a lot of things to find in this world and you should look around for yourself. Seeing this game in action is enough to make sure you remember to check every white paper about the rendering engine. 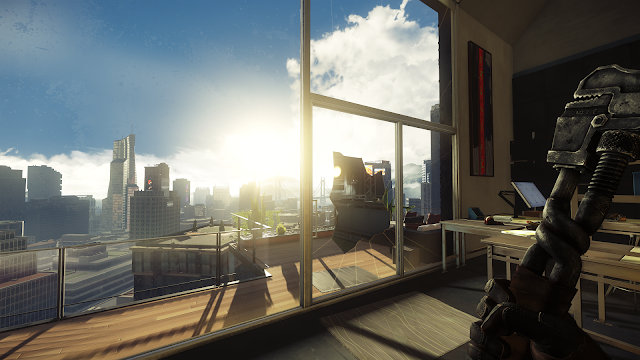 This is, on a technical level, a significant achievement out of the PS4 and something to study in terms of real-time rendering with just enough sub-pixel stability to push a soft 4K that doesn't look like an aliased compromise. On top of that technical achievement, it's also a great art direction and world that leverages the ability to render people, machines, and foliage with equal ease. 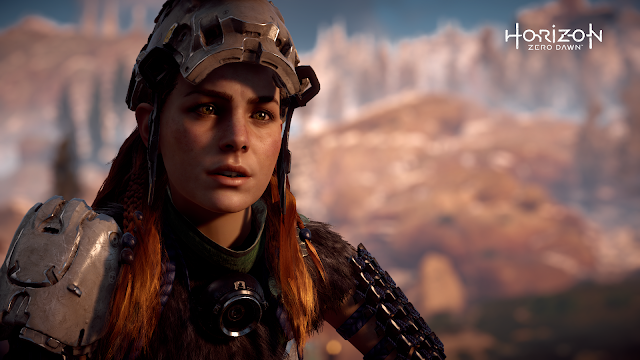 Aloy's travels (another great performance from Ashly Burch) through another post-apocalyptic world offer just enough pieces to keep you engaged with uncovering what happened long before and what the current state of play is. It's neither purely spelunking into the past or only concerned with the here and now - both parts offering a reason to keep exploring for answers. Combat is perfectly serviceable with upgrade trees and enough range of options to allow you to play how you want without ever becoming outstanding. Add in the standard open world affordances, including optional item maps to avoid cluttering the world until you wish to go hunting for the final missing pieces, and you've got a space you can get lost in without ever being forced to aimlessly trudge through. The only slight downer is the lack of vertical traversal options - this is very much the Uncharted/Tomb Raider style of limited predefined climbing paths, not even going as far as what you'd expect in an Assassin's Creed open world. This coming-of-age visual novel revolves around queer girls and baseball. Its somewhat basic art style doesn't get in the way of the writing and that's what'll keep you hooked through the few hours of (seemingly pretty linear) story. Fun, light, and queer; this is more of that refreshing independent content finding ways to reach wide distribution in recent years. The Yakuza series continues what was started in the Shenmue series - building distinctly Japanese open worlds around small, compact areas and filling them with stories that mix the mundane with the explosive. Are you about to shift the balance of power between the great crime families or dropping into an arcade to play some era-appropriate classics between helping someone find a date? Here, you'll do both all wrapped around a decent brawler combat engine and several large skill trees (with stance changes to access each set). This prequel makes for a good starting point for the series (which Sega seem to be planning to update and re-release at least some of with the Kiwami subtitle) with the bright setting of Tokyo during the tail of the 1980s combining with two protagonists whose journey oscillates from heart-breaking to laugh-out-loud funny. Once again (in common with most of the Japanese games that made my list this year) the soundtrack here deftly brings energy to the proceedings and weight to the emotions. Zachtronics puzzles are about expressive play, designing machines around certain functional constraints and evolving your solutions as you figure out new structures to build into complete designs. There is not the answer to the puzzle, only a space of many possible solutions with various local maxima in the metrics of speed, costs, and area (which provides a gradient on which to refine designs beyond just "does it work"). The solutions you craft show your path there, from the basic patterns you prefer to the early design ideas leading to constraints that shape the final design you run. This is engineering catnip, a great sandbox of puzzles you can keep coming back to refine. A sequel to 2011's SpaceChem, this game moves away from concurrency (SpaceChem used two threads/loops per processor, with added parallelism through several processors in most solutions) and towards a simple design problem of coordinating many swinging arms doing a similar job of connecting and separating various orbs (elements) from source compounds to form the product required; all programmed with a simple action bar. The narrative provides a suitable framework for ever more complex puzzles and gives a taste of a world and characters trapped in it. The New Order brought character and an interesting mix of all-out (duel-wielding) shooting & stealth to the Wolfenstein series. It also showed that id tech 5 (designed for massive open spaces) did not lend itself to corridors and contained more than a couple of rather tall difficulty spikes. 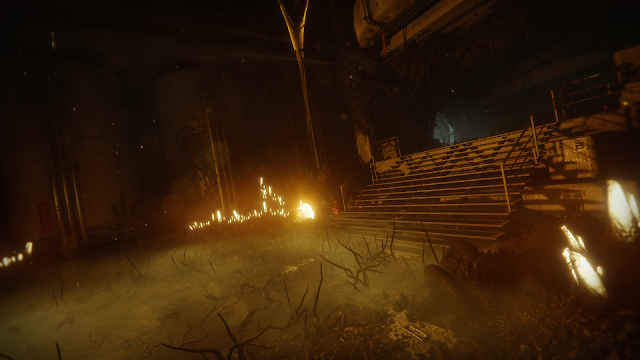 Here, id tech 6 shows a massive step up (even if not quite at the same technical level as Doom last year) and replaying the last game immediately before on the same PC really showed how visuals jumped forward as well as performance. The drama sections and cut-scenes dripping with character return and a better upgrade system quickly allows you to lock up some armour penetration on your ranged rifle to ease through the harder enemies (this completely fixed any difficulty concerns I had playing on Hard, although some of that probably relies on being able to dial in headshots with whatever controller you're using - the only time I felt stuck was in the final boss fight, which I realised is actually optional). In The New Colossus there are far fewer points where I wished the shooting would finish so the story could continue and just as many points where I was hooked on where the story was going. A great advertising campaign (world-building) led into a story that pulls relatively few punches for a mainstream title; this is the game about shooting Nazis we needed in 2017. This series had been on the decline for a while. Resident Evil 4 was the high point for a playable world of horror/action which didn't hate the player (at least with Wii controls allowing precision aiming in an era when not all games had the accuracy on dual-analogues of a Halo) while the immediate sequel provided less of a world but the first workable dual-analogue controls. Since then we've had a bad pure action sequel, several more spin-offs, and very little to recommend. This first person reinvention of the series starts out really leaning back into the horror roots, while building a pretty new pocket of the universe to keep things fresh. Impressive as a return to form that doesn't just retread previous highs, Resident Evil 7 really shows why it's on this list when you put on a headset and play a AAA budget horror game in VR. Being trapped in a 360 degree immersive space to play horror games with great positional sound is something else, quite possibly too much for some. It's an experience you've not had before and hopefully a sign of more things to come. Prey is to System Shock as Dishonored is to Thief. That description alone is enough to attract at least a modest crowd who know exactly what to expect and will feast on another modern immersive sim. To draw in the rest of the crowd, the opening area of Prey perfectly combines some tastes of what is to come with an opening reveal about how the story of deception will play out (as it must in a game built on discovering the backstory of areas and diving into notes and messages to understand what has happened and what there is left to do to shape what comes next). Going through a looped day with that great credit roll during a helicopter flight through a city skyline into being treated as an experiment, watching as a mimic hides in plain sight and things start to all go wrong, to finally uncovering the first secret that the flight was just part of a fancy "Looking Glass" virtual sound stage - the moments of horror, of feeling your only real option is often to hide, and being lied to: these roll through the first half of the game before turning to more of a power fantasy. If you want to see a AAA game set in a lavish traversable space station, infested by hidden creatures intent on destroying you, then this is a place you need to explore. I'm possibly going to side with Dishonored as the slightly better series at this point (and with low sales and leads leaving the studio, we may see far less AAA immersive sims in the next few years, including no sequel to this) but you should definitely check this out; the opening hours are available as a demo on all platforms. Two years later, a new team with a new engine are going back to fill in the backstory of a game I still think back over as the best of the modern adventure game genre. Stripping the core gameplay mechanic out of a series (along with the protagonist) is actually a surprisingly bold move here, considering this is the obvious prequel story set up in the first game which fleshes out a character you never got a chance to meet and the primary love interest in that game. It also gives the chance to embrace the audience Life is Strange found and make the queer subtext into text. This new team, with a new voice cast due to a strike by US workers during production (which has since been resolved), have managed to not fumble it (despite all these causes for concern). Here we get to play as a younger, less cocky, and more uncertain Chloe who is just falling for Rachel Amber. The performances don't quite hit the level achieved by the later episodes of the first season, nor is there quite as much to the writing, but there's just enough there that it'll draw in existing fans and give us what we crave. There is also a bonus episode releasing early next year to finish off this season but even just based on the main three episodes, this is worth it and we can finally stop relying on implied queer subtext. GT Sport has issues. Even after patches, keeping your credits and xp from solo progression is locked behind an online requirement (almost keeping it off this list). The visuals are a bit of a step back from current PC sim/semi-sim offerings (it’s not bad and there are flashes of real attention to detail but a PS4 Pro is working from a significant disadvantage compared to a PC to feed a 4K screen). Collisions seem iffy at best and sound terrible. The assists seem less major performance penalties and more like obvious options to work with (playing on "Expert" with ABS dialled back to Weak, Traction Control is a dial you can set at any point during a race, and there is some Countersteering Assistance that also gets set to Weak on the top predefined tier - that last one being something you do really need to play on a controller rather than a wheel and equivalent to Forza's Normal Steering). Missing: any dynamic racing line with braking-/speed-colours so using the manual gears becomes an assist as it notes which gear you’ll probably want to drop down to for the next corner - which, along with cones on the track edge, give you just enough information to brake confidently your first time into a corner. The most major difference from Forza's model of how assists work: there is no rewind so you'll also be driving more conservatively because you can't afford to fluff a corner on the last lap. The bit that's not racing online is a decent selection of challenges but the actual career mode is a very threadbare offering that only just arrived via a patch. Add a limited section of vehicles (slowly being added via patches), no real upgrades (there are two dials, one for engine performance and one for weight that you can upgrade to push cars into different vehicle classes), and possibly a few less tracks than you'd really want (with no dynamic time or weather) and it sounds like a hard sell. And yet, Sony got worried by the reception and quickly discounted this into the bargain bin and I got hooked. There are some smart choices like a reasonable daily distance goal (about 15 minutes of fast driving) which rewards a free random car and the challenges & missions have a decent range of demands with fixed vehicles (plus some freedom to pick your own car in a class in some events - it's a somewhat limited career mode inside the other modes) while also throwing out lots of car rewards. What really captured me was what I started to look at once I'd stopped obsessing over the triggers around each corner - tyre wear, fuel consumption (a dial you manage during the race, next to traction control), when to pit. These are all a million miles from Forza Motorsport 7's model of magic tyres that transform into wets once the rain starts and AIs that don't experience tyre wear even when it's set to Simulation. Even when you do decide to pay more attention to the triggers, the UI offers information that makes it easier to know what you need to do - rather than flat blue bars, GT paints the top of the white bar red when it's too much trigger (allowing you to learn what each vehicle demands). I always thought I’d generally spend much of my 2017 slowly improving with rewind to let me race up until the edge of my skill/attention (while needing a clean lap to leaderboard and so actually compare); that I’d always be for the development of better reactive skills (eg ABS etc driving assists off, managing a changing track condition) rather than memory skills (eg no braking line). And yet I’ll jump into GT Sport for a bit every day or take on an endurance challenge. It's making me question most of what I thought I wanted out of a semi-sim package and even the basics of how they should control. When I played DriveClub it was the dynamic time and weather (plus mini-challenges) that kept each track fresh but here it is the tyres and fuel that perform a similar role in giving each race an arc. Once an accessible (ie works well on controller) semi-sim game does everything at once, that'll be truly exceptional. As I mentioned a few moths ago, this was what I wanted from a new Halo game. There isn't an endless online experience waiting for you (unless you get deep into the middling online PvP - it's fun enough but you've seen it all before) but if you've got 20-30 hours then there's a good campaign and some less structured fun to be had (some with friends or even strangers) all the while slowly levelling up your gear and finding which weapons really speak to your play style (at which point you feed the drops you get into those to make them level up with you). The visuals, freed of PS360 era ports, provide great vistas and lovely lighting over a range of locations onto which the missions and other corridor sections have been attached. The shooting feels precise and makes to move to mouse without feeling like you're playing something meant for sticks (something the old Halo ports never managed). I don't think this will stand up with some of the releases this year, something looked back on in a decade as why 2017 was amazing for games, but it's certainly the pinnacle of what Bungie have been building for the last 20 years. This is, as has now becomes the expectation, an RPG that combines dungeon crawling with a significant teen social drama that drives you through an extensive cast and pantheon of villains. As always, the music selection is catchy and will worm its way into your brain, fused to the stylish presentation that permeates this game. Always a series that slowly releases significant iterations, this has again completely changed the style while retaining the premium (and not seen elsewhere) feel of the presentation. Rather than relying on a catchy level up chime that's been iterated in half a dozen sequels, Persona 5 creates a completely new tune that makes it feel unique and brands this game. It's the little touches that make each sequel in this series feel special and explain why it's been years since we last played new content. The story of friendship here moves towards actual headlines shaping the various incidents you'll encounter as you level up and fuse your various personas. The adults have failed you, carceral solutions block any path forward, and now extreme actions are the only answer to provide any justice. Mechanically the ability to talk to and persuade enemies replaces games of chance in recruiting new personas, which is a welcome move back to Shin Megami Tensei. If you've seen any footage (something Atlus Japan have made harder by trying to ban users from recording and sharing footage of the game) then you've seen just how stylish every inch of the presentation is here, even if the game is clearly a PS3 port (as noted, a very slow release schedule) and could have really done with higher upscaling considering (especially on PS4 Pro, where there is no Pro Mode patch). Classic Sonic is back in 2017. The work of several fan-developers who provided various ROM hacks and engine rebuilds for classic 2D Sonic games, Sega handed over an official license and got behind a passion project, resulting in a great new game in the series. This is exactly the Sonic you remember from the early '90s, managing momentum through massive levels in which you could build up a stunning top speed, only now with boss fights that were never this good before. Visually it's an homage that does a few things those old games couldn't 25 years ago. Hopefully this will lead to a sequel that breaks away from remixed themes and builds a game out of entirely new worlds. A visual novel about a dad dating a bunch of dads and his relationship with his teenage daughter. This fantasy world is just filled with joy and kindness, a welcome escape from reality into an alternative cul-de-sac populated with queer guys. Consistently well written, there are touches of reality mixed in with the fantastical but this very much feels like the sort of escapism you sometimes need, that rejects the idea that representation always has to be "gritty" to have value. Zelda: Breath of the Wild - It was Eventide Island when I realised this wasn't going to get onto my list (despite looking good for sweeping many publication's GotY awards). Playing some months after the buzz, I'd been looking for a new Morrowind (or even Far Cry 2) and found a world devoid of interesting writing or even much diverse use of the game systems outside of Shrines (which I'd already started to wear out after only scratching this massive world). But everyone spoke of Eventide as a really clever section you stumble onto and fall in love with so I'd avoided all spoilers or hunting for it. At some point, I'd just naturally arrive there... and 20 hours in, I did. No real narrative payload, not even an interesting visual flourish, and three incredibly stock challenges involving collecting metal balls later, I completed the island in about 25 minutes. I actually went and checked a walkthrough to make sure I'd not accidentally sequence-broken it and missed the good part everyone loved. I hadn't (although it seems many don't know that Hinox can be paraglided onto). This wasn't something new, this was yet more copy-paste problems I'd seen elsewhere in the game that didn't ask me to be inventive beyond the very surface veneer of novelty (here, taking away my disposable weapons and locking away my partially-upgraded clothing - but under that it has no more variety than an MMO "collect X of Y" quest). On top of a story that seems decades out of date (with the worst kind of gender essentialism dripping from the moment to moment and bigger picture), BotW creates a massive world and then fails to find something to fill it with. 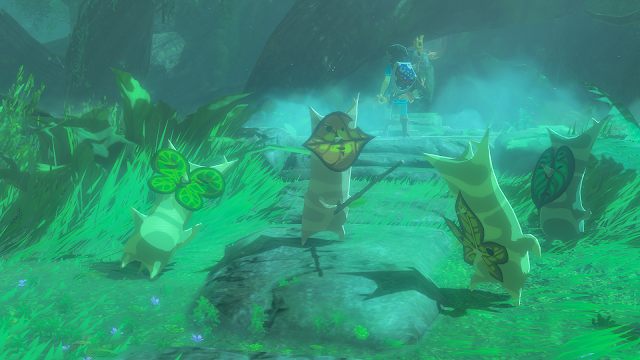 There are 900 Korok Seed puzzles but actually there are about 9 puzzles which have been endlessly copied to locations on the map and which you'll need to stumble upon (and if you want to get round the inventory limitations then you better keep looking for them) as there's no way to get a map pulse or reveal (basic affordances figured out years ago). In another pair of examples, the Shrines seem to exist more as fast-travel nodes than because they had that many original ideas for puzzle rooms and the mount system is about as broken as you can make it - completely useless for the most part. You have to wonder, given how many open world games (MMO and offline) have refined mount systems to be low friction while not trivialising traversal, who decided to do it this way. Many of the systems presented here seem to similarly ignore where the genre design has gone in the last decades. The climbing traversal and carefully designed sight-lines are fun for the first dozen hours but there's little of substance under it and it's a great lesson in why something like inFamous (which also refined traversal, slowly allowing you to run anywhere by First Light) was smart to stick with 5-15 hour experiences. The potential is here but the praise feels like it will age as well as that for Super Mario Sunshine. Forza Motorsport 7 - I knew what I wanted this year from a driving game. An engine I'd already seen running wonderfully on Windows, masses of cars and circuits (new and returning), and a system of assists/difficulty that I'd slowly advanced through and was ready to push (with rewind always there to catch a slightly too aggressive corner attempt). Then it all started to fall apart. Thanks to homologation, I’m almost never thinking about the fun of upgrading a car to a spec tier but rather am stuck with the precise list of parts that lock it to the specs (it seems far more common for there to the be one restrictor you have to apply than being a range of viable parts you can use to build the car to the requirements) and that’s it. That’s the car - one that’s often kinda broken from what it should be due to being restricted from the racing spec it would have in real life and competing with a load of other vehicles that... are kinda the same. There’s a bit of variety to it but really, in order to make all cars in a spec competitive, every car has to roughly be able to do corners at the same speed and hit the same top with similar acceleration (otherwise some cars would be vastly better than others and it would just depend on the track). Somehow I'm at the end of the year with several dozen hours in a game that just doesn't grip me like GT Sport does. It's a fine game, it's exactly what I thought I wanted, but I'd much rather be dealing with proper tyre wear, fuel richness dials, and pit stop strategy (even with a limited car roster) rather than finessing braking (without ABS) with infinite cars that all feel homologated into a blur. Night in the Woods - It just didn't quite grab me like it did many other people. Honourable mention but in a year with this many great games, this angsty tale couldn't get into my top tier. Tales of Berseria - The sixteenth main Tales game and yet this feels like a reinvigorated series that has stories left to tell. Unfortunately this year has just had so many amazing and huge games (plenty of which didn't make the list) that I've not had enough time to play this enough to put it on the big list. It's definitely got character from what I've played of it and most years I'd expect I'd have had more time to give to it. Torment: Tides of Numenera - Speaking of not having time for RPGs, who would have thought that the spiritual successor to Planescape: Torment would be released and I wouldn't be able to find time to play more than the start of it. The 2D style revitalised in Pillars of Eternity is back but it'll have to wait until I find time in 2018. Atelier Firis - Wow, and the curse of 2017 strikes again. Now the Atelier series have eased off the time constraints, they feel a lot more fun to play as light RPGs with a lot of heart. Hopefully I'll get to explore it more fully in 2018. Assassin's Creed: Origins, Dishonored: Death of the Outsider, Hellblade: Senua's Sacrifice, What Remains of Edith Finch, Uncharted: The Lost Legacy, Divinity: Original Sin II, The Evil Within 2, >observer_, Pyre, & Mario + Rabbids Kingdom Battle. Ye, it's been a year and a half!